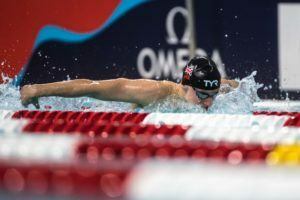 In addition to Olympic champion Sun Yang‘s punishing performance in the men’s 400m freestyle tonight at Chinese Nationals, the qualifying meet for this summer’s World Championships, several other powerhouse athletes took to the Qingdao Sports Center pool. The women’s 400m free final saw Wang Jianjiahe soar to the top of the podium, producing a quick time of 4:03.77 to win by over a second. Runner-up came in the form of reigning national record holder Li Bingjie, who clocked a solid time of 4:05.08, while Dong Jie rounded out the top 3 in 4:07.09. 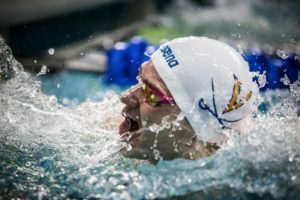 For Wang, the 16-year-old recently punched a new Chinese and Asian Record in the 1500m freestyle while competing at the Pro Swim Series in Des Moines. In this 400m free event, Wang has already been as fast as 4:05.28 at that same meet, but was able to slice off more than a second to put up her fastest time of the season and move up the world rankings to #3. As for her domestic rival Li, the 17-year-old’s time tonight of 4:05.08 falls short of her season-best, which is represented by the 4:03.29 she clocked in Des Moines. Team Zhejiang took the men’s 4x100m freestyle relay title in a time of 3:18.17, with the fastest splits of the field coming from He Junyi in 48.31 and Yu Hexin in 48.89. Zhejiang also won the women’s edition of the same event, punching the winning effort of 3:38.17. Top splits of the field came from Zhu Menghui‘s 54.06, Yang Junxuan‘s 54.06 and Wu Yue‘s 54.46. The remaining events this evening were in the form of semi-finals, setting up some highly anticipated finals for tomorrow night. The women’s 100m fly will see leader Zhang Yufei try to hold on to her position for a gold medal, as she leads the women in 57.63, the only sub-58 second outing of the field thus far. Zhang took Asian Games silver in a mark of 57.40, so she’s already within striking distance of her season-best effort. Behind her is Wang Yichun, who holds the 2nd fastest seeded time in 58.32, while Lin Xintong is still very much in the mix with a 59.37. National Record holder Yan Zibei came oh-so-close to overtaking his own Chinese standard, falling just .04 shy. Yan’s personal best and national mark stands at 58.92, the time he produced at these Chinese Nationals two years ago. Tonight, Zibei punched a time of 58.96 to lead all swimmers, as well as enter the world rankings at #3, behind Adam Peaty and Belarus’ Ilya Shymanovich. Wang Peng leads the men’s 50m fly field after tonight’s semi-final, holding the fastest time of 23.66, just .01 ahead of Yu Hexin‘s 23.67. Li Zhuhao is right behind in 23.70. The women’s 200m IM saw Ye Shiwen take the top time of the semi-final, collecting lane r in a time of 2:13.73. 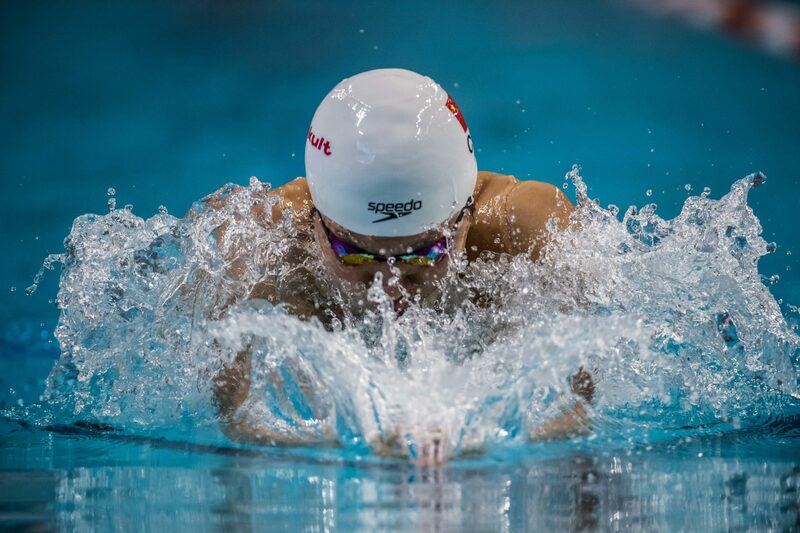 Hong Jinquan, who celebrated his 16th birthday earlier in this month, posted a 49.22 split in 400 free relay after his individual 400 free double! He competed in YOG last year.